You think Bublé sounds amazing, then Blake opens his mouth to sing and it’s out of this world! When two beautiful singers get together, you know you’re in for a show! 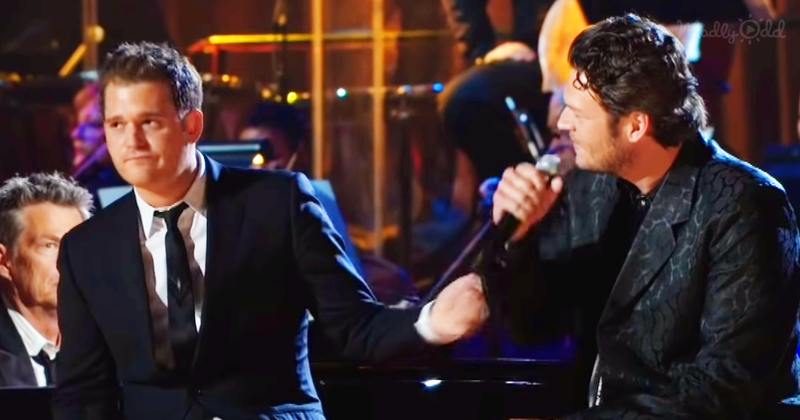 That’s what happened when an unexpected duet happened between Michael Buble and Blake Shelton. The pair have their own unique sound and yet together they sound amazing! As Shelton came onto the stage, Buble was quick to situate them together for the duet. Sharing a kind hello, then diving right into the mashup song. These are two very confident men, they know their voices, and it really shows in this performance. Taking the lead, Buble opens up the song, and there are already cheers from the crowd. When Shelton chimes in, those cheers get even louder! The two move so fluidly, with their voices, throughout the song. Taking turns, stepping in, always hitting the mark right when it’s needed. The song Home was written and released by Buble in 2005, and then covered by Shelton in 2007. In this video, we get to hear the two come together to perform this mega-hit. While on stage already, Buble got a surprise when Shelton came out to sing with him! Both men are great artists, the crowd was lucky to get this show! This spectacular one-night only concert by David Foster and his famous friends finds the songwriter and hit producer gathering together the best tracks from his bottomless well of hits and inviting some talented folks to come along and help perform them. Not only are the songs magical, but the performances are also just as enchanting, including appearances from Andrea Bocelli, Michael Bubl‚, Josh Groban, Kenny G, Katharine McPhee, Celine Dion, Blake Shelton, Brian McKnight, and Charice. Spotlighting #1 hits, award-winning songs, and other favorites. This is a beautiful piece, sang by amazing artists. Getting to hear them sing together was a treat that we all needed! Some listeners said, “This is a beautiful song and an amazing duet!” Another said, “With Blake Shelton’s masculine voice, and Michael Buble’s soft/romantic voice, this duet can melt a woman’s heart!” I think both of these statements are true! If you were moved by this one-of-a-kind Buble-Shelton performance, share it because some things in life were meant to be enjoyed. “Home’ is one of them.